Summary: The MTA box wagon is a simple-looking type with a complicated history. Together with the similar but more numerous MFA and MHA types, the MTAs are used to carry ballast and spoil in connection with infrastructure works. The three types often work in mixed rakes and were responsible for replacing the last of the vacuum-braked Grampus wagons. History: In mid-1998 freight company EWS purchased 201 TTA oil tank wagons made redundant by the withdrawal from rail freight operations by Shell. A new TOPS code of MTA was issued to cover their conversion into box wagons for infrastructure use. At the time, deliveries were in progress of MHA and MEA box wagon conversions from hoppers but there was a need for yet more, partly to replace the many vacuum-braked Grampus, Clam and Plaice wagons still in stock in 1999 and partly to supplant the fleet of long wheelbase Sea Urchin conversions, which were not proving particularly productive. The MTA code is interesting as it may have been chosen to reflect the tank wagon parentage of the conversions, or because the new wagons were superficially similar to the MTV type introduced in 1974. Ironically these too were built on the chassis of private owner tank wagons, and were designed to carry sand. The logical code of MSV was already in use for Ironstone tipplers but in the event the MTVs were also used on stone traffic. The MTV fleet was recoded ZKV when it was transferred to departmental use, while the �Limpet� wagons mentioned below were initially coded ZKA. One final curiosity is that the �Limpet� fleet was numbered from DC390150 upwards to avoid possible confusion with the MTV/ZKV wagons (B390000 to B390149), even though the two types were technically in different number series (air-braked and B-prefixed respectively). An initial contract was placed with RFS (Doncaster) for the fitting of new bodies to 150 (later increased to 220) wagons. However, the MTA code appeared earlier than expected when it was also applied to 12 former ZKA �Doorand� box wagons. 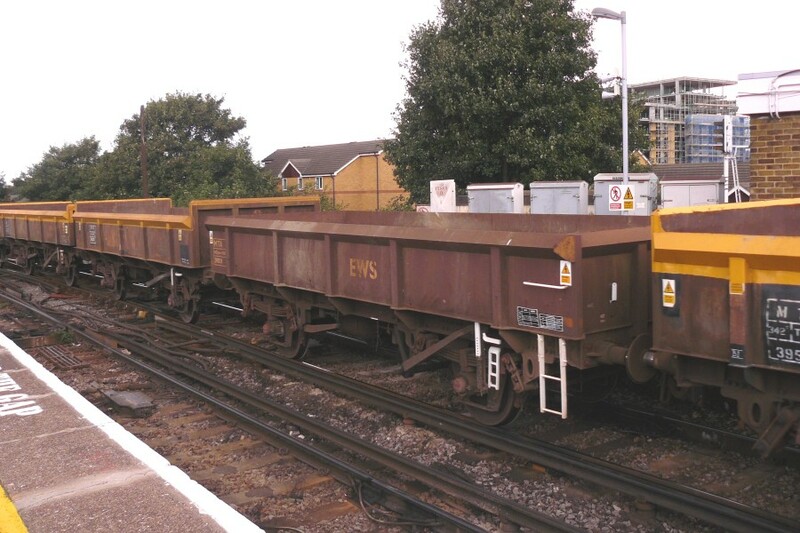 These wagons had also started out as tanks but had been among many rebuilt as private-owner box wagons for aggregates traffic in the late 1980s. About 180 of the resulting POAs were bought by BR for use on infrastructure trains in 1993/1994, these becoming ZKA �Limpets� numbered in the DC390150 to DC390331 range. Most had holes cut in the side to avoid overloading but a handful had the sides and ends cut-down to a level more suitable for the materials they would now be carrying. Such conversions retained the ZKA TOPS code but received the new Fishkind of �Doorand�. In August 1998, twelve Doorands were renumbered as 395001 to 395012 and recoded MTA-A with design codes in the MT002A-MT002D range. Design codes in the MT001 series had already been issued for the MTV type mentioned earlier. Photographic evidence shows that some of this first batch retained their Doorand numbers and ZKA coding until 2001 at least. Deliveries of the main batch of MTAs started in January 1999. The new bodywork was similar to that on the former Doorands but had ends the same height as the sides. The Doorand wagons made use of an existing horizontal rib on the wagon ends to produce a new top capping, this resulting in ends that were slightly taller than the sides. In both cases, the sides were capped with an angled section and featured five vertical ribs. Due to variations in the source wagons used, the design codes allocated covered most of the range from MT003A to MT004D. The order was reportedly cut back to cover just 200 wagons but in the event, 222 conversions were undertaken with numbers 395013 to 395234 applied. All the wagons were delivered in EWS maroon with the top cap in yellow. The last of the source wagons arrived at Doncaster works (by then rebranded Wabtec) in May 2000 and were completed by September. Also released at about the same time were seven additional wagons numbered 395235 to 395241. The source wagons were again Shell TTA tanks, but ones that had been bought by BR back in 1992. Renumbered into the departmental series as ZRAs DB999106 to DB999112, they had been used carrying water between Dover and Ramsgate. As MTAs they were allocated design codes MT006A, MT007A and MT008A to cover detail differences. Two points about this are that MT005 appears to have been skipped, for reasons unknown. Secondly, the use of three separate design code series, instead of variations (such as MT006B, etc) is notable. After a gap of a few years, more MTAs were converted at Margam and at Marcroft Engineering in Stoke. The source wagons were once again the �Limpet� fleet of former private-owner box wagons. A block of 155 new numbers was allocated (395251 to 395405) but in a change from normal practice these were tied to the order of the source wagon numbers. Conversions therefore appeared in a fairly random sequence. The Limpet fleet had seen some changes in the intervening years, with many now recoded as MKAs and several renumbered in a new series starting at 393000. Some of the new MTAs therefore were on their fifth stock number. As an example, TTA tank TRL51713 was rebuilt as POA TRL5158 in 1987, then renumbered as ZKA DC390198 in 1993. It quickly became MKA 393000 and finally MTA 395373 in 2007. The latest conversions featured only patch repainting and some still bore traces of their private owner livery from at least 13 years previously. Like the former �Doorands�, they had ends that were slightly taller than the sides and capped with a square section rather than the angled tops found on the direct tank to MTA conversions. Design codes were in the range MT009A to MT009G, the 20 wagons to MT009B also having a revised TOPS code of MTA-B (all others being MTA-A). By early 2008, 134 of the batch had been renumbered, with a handful of MKAs still to be done. Withdrawals in the interim meant that it was unlikely that all 155 numbers would appear. MTAs are often to be seen in well mixed rakes with similar MFA and MHA wagons. This is now known to be deliberate, there being a instruction that no more than five MTAs should be coupled together, and that there must then be at least three wagons of another type before the next MTA. This is due to the MTAs having excessive brake force when running empty. Contributor Kevin C got in touch to mention an incident when he dispatched a train formed of 52 newly converted MTAs and a track laying machine, all hauled by a class 60. The train train later became divided, damaging the drawbar on the track machine. 26/07/2009: Notes on brake force problems added, with thanks to Kevin C.
Comparison of MTA variants at Lewisham, 20th August 2008.